Sinagua cliff dwelling (Montezuma Castle), Arizona. Cliff-dwelling is the general archaeological term for the habitations of prehistoric peoples, formed by using niches or caves in high cliffs. Some are complex with additional excavation, others with construction of walls, doorways, and other structures using stones and other locally available materials. The practical advantages of such dwellings include substantial shelter and safety due to their inaccessibility. In many cases the structures show remarkable architectural beauty. 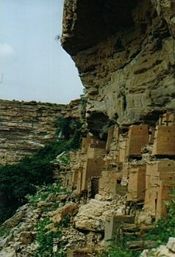 Cliff-dwellings are found throughout the world and in some cases are still inhabited. They are common among the canyons of the Southwestern United States where they served as the dwellings of cultures such as the Ancient Pueblo People. Cliff-dwelling is the term used for any form of housing that is constructed in the rock of high cliffs. In many cases the structures are astonishing in both their beauty and inaccessibility. The foundation of these dwellings is of stone, usually soft enough for excavation and of large enough extent to produce a large rock formation. The stone may be tuff, rock consisting of consolidated volcanic ash ejected from vents during a volcanic eruption. In some cases cliff-dwellers are referred to as troglodytes or cave dwellers, particularly those whose dwelling is of the cavate type. Some of the most famous cliff-dwellings are the North American cliff-dwellings, particularly among the canyons of the southwest, in Arizona, New Mexico, Utah, Colorado, and Chihuahua in Mexico, some of which are still used by Native Americans. There has been considerable discussion as to their antiquity, but modern research finds no definite justification for assigning them to a distinct primitive race, or farther back than the Ancient Pueblo people, ancestors of the modern Pueblo people. The area in which they occur coincides with that in which other traces of the Pueblo tribes have been found. The niches which were used are often of considerable size, occurring in cliffs to a thousand feet in height, and approached by rock steps or log ladders. Moki steps (sometimes Moqui steps) are a recurring feature found near cliff-dwellings in areas of the American southwest previously inhabited by the Ancient Pueblo Peoples and other related cultures. The steps consist of alternating hand and toe holds carved into vertical or near-vertical sandstone surfaces. The steps are usually two to three inches deep, and three to four inches in width and height. They may have allowed relatively quick access to difficult-to-reach areas such as slot canyons, look-out positions, and granaries. In some cases, Moki steps are thought to have provided access to fertile canyon bottoms from more defensible dwellings on or above surrounding cliffs. The steps may have been used in conjunction with handmade ropes. Similar sets of depressions may have been carved by non-indigenous settlers, or explorers or visitors may have deepened or widened a previously existing set of Moki steps. The Southwestern United States is home to numerous examples of cliff-dwellings constructed by early indigenous tribes, such as the Ancestral Pueblo People, Mogollon, and the Sinagua people who are ancestors of the Hopi. Following are several of the best preserved examples. Bandelier National Monument in New Mexico is a 33,677 acres (13,629 ha) National Monument preserving the homes of the Ancestral Pueblo People. It is named after Swiss anthropologist Adolph Bandelier, who researched the cultures of the area. Looking over the cliff dwellings, Bandelier, announced "It is the grandest thing I ever saw." The Frijoles Canyon contains a number of cliff dwellings, as well as kivas (ceremonial structures), rock paintings and petroglyphs. Some of the dwellings were rock structures built on the canyon floor; others were "cavates" produced by voids in the volcanic tuff of the canyon wall and carved out further by humans. Canyon de Chelly National Monument is located in northeastern Arizona within the boundaries of the Navajo Nation. The monument covers 83,840 acres (131.0 sq mi; 339.3 km2) and encompasses the floors and rims of the three major canyons: de Chelly, del Muerto, and Monument. The site preserves ruins of the early indigenous tribes that lived in the area, including the Ancient Pueblo Peoples and Navajo. Gila Cliff Dwellings National Monument is located in the Gila Wilderness within the Gila National Forest in southwestern New Mexico. It contains several archaeological sites from the Mogollon culture. The cliff contains the ruins of interlinked cave dwellings built in five cliff alcoves by the Mogollon peoples who lived in these cliffs from between 1275 and 1300 C.E. They used mortar in constructing the walls of their homes and handprints of the builders can still be seen in some places. Archeologists have identified 46 rooms in the five caves, and believe they were occupied by 10 to 15 families. The dwellings were a perfect place for human living. The caves provided adequate shelter, while the wooded area concealed the homes. The nearby area also provided for growing and finding food. The Honanki Heritage Site is a cliff dwelling and rock art site located in the Coconino National Forest, about 15 miles west of Sedona, Arizona. The Sinagua people, ancestors of the Hopi, lived here from about 1100 to 1300 C.E. Jesse Walter Fewkes of the Smithsonian Institution named the site "Honanki," which means "Bear House" in the Hopi language. Palatki Heritage Site is located in the Coconino National Forest in Sedona, Arizona (Palatki meaning "red house" in the Hopi language). Built in the formidable red rock cliffs of the area are the ruins of cliff-dwellings, dating from 1100 to 1400, belonging to the Sinagua. The Mesa Verde National Park and UNESCO World Heritage Site is located in Montezuma County, Colorado. It was created in 1906 to protect some of the best preserved cliff dwellings in the world, including the Cliff Palace, which is thought to be the largest cliff dwelling in North America. The ancient Pueblo People inhabited Mesa Verde between 550 to 1300 C.E. By 750 C.E., the people were building mesa-top villages made of adobe. By the late twelfth century they began to build the cliff dwellings for which Mesa Verde is famous. There are a large number of well preserved "cliff dwellings," houses built in shallow caves and under rock overhangs along the canyon walls. The structures contained within these alcoves were mostly blocks of hard sandstone, held together and plastered with adobe mortar. Specific constructions had many similarities, but were generally unique in form due to the individual topography of different alcoves along the canyon walls. In marked contrast to earlier constructions and villages on top of the mesas, the cliff dwellings of Mesa Verde reflected a region-wide trend towards the aggregation of growing regional populations into close, highly defensible quarters during the thirteenth century. Round tower, Cliff Palace in 1941. The Cliff Palace is the largest cliff dwelling in North America. Tree ring dating indicates that construction and refurbishing of Cliff Palace was continuous from c. 1190 C.E. through c. 1260 C.E., although the major portion of the building was done within a twenty-year time span. The Cliff Palace contains 23 kivas (round sunken rooms of ceremonial importance), and 150 rooms and had a population of appropriately 100 people. One kiva, in the center of the ruin, is at a point where the entire structure is partitioned by a series of walls with no doorways or other access portals. The walls of this kiva were plastered with one color on one side and a different color on the opposing side. The Cliff Palace is thought to have been a "social, administrative site with high ceremonial usage." It was abandoned by 1300, and while debate remains as to the causes of this, some believe a series of mega-droughts interrupting food production systems is the main cause. Square Tower House almost reaches the cave "roof." It was in ruins by the 1800s. The National Park Service carefully restored it to its approximate height and stature, making it one of the most memorable buildings in the Cliff Palace. Slightly different-colored materials were used to show it was a restoration. Montezuma Castle National Monument is located near Camp Verde, Arizona, in the Southwestern United States. On December 8, 1906, President Theodore Roosevelt declared the site as one of the first National Monuments. Although extensive looting had resulted in few original artifacts remaining, Montezuma Castle is one of the best preserved prehistoric cliff-dwellings in North America. These cliff-dwellings were built by the Pre-Columbian Sinagua people, northern cousins of the Hohokam, in the early 1300s. When European Americans discovered them in the 1860s, they named them for the Aztec emperor Montezuma II. However, the Sinaqua dwelling was abandoned 100 years before Montezuma was born. Moreover, the dwellings were not a castle but more like an apartment building. The five-story stone and mortar dwellings contain 20 rooms and once housed about 50 people. A natural overhang shades the rooms and shelters them from rain. The dwellings were carved into the limestone of a high cliff, requiring ladders to reach them and providing excellent defense. Navajo National Monument is located within the northwest portion of the Navajo Reservation in northern Arizona. It preserves three of the most intact cliff dwellings of the ancestral puebloan people: the Kiet Siel (commonly spelled Keet Seel), which stands for "broken house" in Navajo, and Betatakin (which means "House Built on a Ledge" in Navajo) cliff dwellings, and the Inscription House site, further west, which is currently closed to public access. These three sites were declared a national monument in 1909. Kiet Siel was first occupied at around 1250 C.E., during a time in which a large number of people were believed to be aggregating in sites such as this in this part of the American Southwest. It experienced a construction boom between 1272 and 1275, with construction then slowly tapering off and halting completely by 1286, after which there was no evidence of structures being built until its subsequent abandonment some 20 years later. At its peak, it is believed that up to 150 people inhabited this site. Betatakin is a smaller structure with only has one kiva, whereas Kiet Siel has several. It had about 120 rooms at the time of abandonment, although only about 80 rooms remain, due to rock falls inside the alcove. During its two-decade heyday Betatakin is estimated to have housed a maximum population of about 125 people. The large building in the Cueva de las Ventanas, Huapoca, Mexico. The Huapoca Canyon is located west of the town of Madera, Mexico. 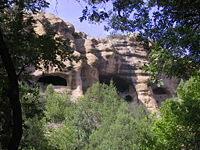 The archaeological site includes a series of cliff-dwellings built in natural caves in the cliffs of the Canyon. Early Spanish explorers named the site Cuarenta Casas (forty houses) based on their speculation of the total number of structures. Construction occurred during the height of Paquimé (Casas Grandes) (1205-1260 C.E. ), a period corresponding to the late Mogollon culture period. It was a refuge site, similar to others at the Mesa Verde and Bandalier sites. The buildings share the typical T-shaped doorways of their northern neighbors and are constructed from adobe and rock stucco floors. The Bandiagara Escarpment is a sandstone cliff in the Dogon country of Mali. The Tellem people inhabited the escarpment until the fifteenth century, the cliffs aiding them by providing sanctuary into which they were able to retreat and conceal themselves. The Tellem legacy is evident in the caves they carved into the cliffs to bury their dead high up, far from the frequent flash floods of the area. They built dwellings around the base of the escarpment as well as directly into the cliff-face and many of these structures are still visible in the area. The Tellem built dwellings around the base of the escarpment as well as directly into the cliff-face. Many of these structures are still visible in the area. The Dogons arrived in the fourteenth century, and took over many of these Tellem structures, expanding their villages in defensible positions along the walls of the escarpment as well as moving along the escarpment. Cappadocia is a historical region that lies in eastern Anatolia, in the center of what is now Turkey. The Cappadocia region is largely underlain by sedimentary rocks formed in lakes and streams, and ignimbrite deposits erupted from ancient volcanoes during the late Miocene to Pliocene epochs. The volcanic deposits are soft rocks that the people of the villages at the heart of the Cappadocia Region carved out to form houses, churches, and monasteries. 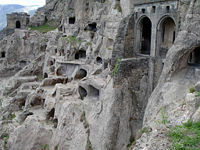 In addition to these structures built into cliffs, Cappadocia also contains several underground cities largely used by early Christians as hiding places before their religion was accepted. The Guyaju Ruins, showing ancient cave dwellings, are located in Yanqing County, China. In Yanqing County located about 57 miles northwest of the city proper of Beijing, China are found the ruins of cliff-dwellings. On each side of the precipitous cliffs there are adjacent stone houses varying in size. They are interlinked, some perpendicularly, others horizontally. The Ancient Cliff House (Guyaju) was hewn from the craggy cliffs and has more than 110 stone rooms, making it the largest cliff residence discovered in China. The origin of Guyaju is a mystery. It is thought that the dwellings are over a thousand years old, constructed by ancient people. 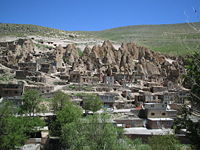 Kandovan is located in the province of East Azarbaijan, near Osku and Tabriz, Iran. Its fame is due to its troglodyte (cave dweller) house, some of which are at least 700 years old and are still inhabited. The unusual rock cones, unique to Kandovan in this region, were formed from volcanic ash from an eruption of Mount Sahand which was hardened and shaped over thousands of years. The hardened material is strong enough to form the walls and floors of a house, also acting as an efficient insulator keeping the homes cool in summer and warm in winter. It is assumed that the caves were first occupied by people fleeing an advancing army, who they continued living there, expanding the caves to form permanent multi-storey houses. However, it has been suggested that the present inhabitants are successors of earlier cave dwellers from 1600-3000 years ago, which would have made them contemporaries of the first known Zoroastrians in the region. 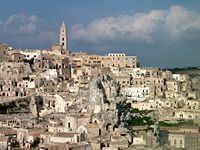 The Sassi di Matera (meaning "stones of Matera") are prehistoric cave dwellings in the Italian city of Matera, Basilicata. The Sassi are houses dug into the tuff rock itself, which is characteristic of Basilicata and Puglia. Many of these "houses" are really only caverns, and the streets in some parts of the Sassi often are located on the rooftops of other houses. Situated in the old town, they are composed of the Sasso Caveoso and the later Sasso Barisano. The Sassi originate from a prehistoric (troglodyte) settlement dating back to the Palaeolithic period. Neolithic inhabitants transformed the caves into houses and over time the city has developed in a manner referred to as "Spontaneous Architecture" because of how it conforms to the natural environment. Caves are carved out one above the other such that the roof of one house may appear as a stairway, a garden, or the floor of another house. Vardzia is a monastery dug into the side of the Erusheli mountain in southern Georgia on the bank of the Mtkvari River. Queen Tamar ordered the construction of this sanctuary in 1185 as protection from the Mongols. The underground fortress had 13 levels and contained 6000 apartments, a throne room, and a large church; its only access was through a hidden tunnel. The outside slope of the mountain was covered with the fertile terraces, suitable for cultivation, for which an intricate system of irrigation was designed. In 1283 an earthquake destroyed approximately two thirds of the city, exposing the caves to outside view and collapsing the irrigation system. The church was reinforced and a monastery community maintained it until 1551 when it was raided and destroyed by Persian Shah Tahmasp I. Today the place is maintained by a small group of zealous monks who returned in the twentieth century and determined to preserve this historical place. Every morning at seven they ring the bell in the high arch. ↑ John Annerino, Canyoneering (Stackpole Books, 1999, ISBN 978-0811727006). ↑ Richard F. Fleck, A Colorado River Reader (Salt Lake City, UT: University of Utah Press, 2000, ISBN 978-0874806472). ↑ National Park Service, Bandolier National Monument. Retrieved August 8, 2011. ↑ National Park Service, Gila Cliff Dwellings. Retrieved September 1, 2011. ↑ U.S. Forest Service, Honanki Heritage Site - 10,000 years of Ancient Rock Art Coconino National Forest. Retrieved September 1, 2011. ↑ John Kantner, Ancient Puebloan Southwest (Cambridge: Cambridge University Press, 2004, ISBN 978-0521788809), 161-166. ↑ National Park Service, Cliff Palace, Mesa Verde. Retrieved August 31, 2011. ↑ Chris Turney, Ice, Mud & Blood: Lessons of Climates Past (New York, NY: Palgrave Macmillan, 2008, ISBN 978-0230553828). ↑ National Park Service, Ancestral Puebloans of Mesa Verde, Mesa Verde. Retrieved September 1, 2011. ↑ National Park Service, Preservation of Archeological Sites, Mesa Verde. Retrieved September 1, 2011. ↑ National Park Service, Montezuma Castle National Monument, Montezuma Castle. Retrieved September 1, 2011. ↑ Susan Lamb, Montezuma Castle National Monument (Western National Parks Association, 2004, ISBN 978-1583690413). ↑ 13.0 13.1 Montezuma Castle: Most Preserved Ancient Cliff Dwellings in America Arizona Leisure, 2007. Retrieved September 1, 2011. ↑ 14.0 14.1 David Roberts, In Search of the Old Ones: Exploring the Anasazi World of the Southwest (Touchstone Press, 1996), 271. ↑ Cave Dwellings of the Huapoca Canyon, Mexico Adventures Great and Small, 2005. Retrieved September 1, 2011. ↑ Ancient Cliff House (Guyaju), Beijingtrip.com. Retrieved August 31, 2011. ↑ Guyaju Scenic Area, BeijingImpression.com. Retrieved August 31, 2011. ↑ K. E. Eduljee, Kandovan Zoroastrian Heritage. Retrieved August 31, 2011. ↑ UNESCO, The Sassi and the Park of the Rupestrian Churches of Matera, UNESCO World Heritage Centre, 2011. Retrieved September 1, 2011. ↑ Fabrizio Fiorenzano, The Caves of Matera Fabrizio Fiorenzano Photography and Art. Retrieved August 31, 2011. ↑ Vardzua Cave Monastery, Atlas Obscura, 2011. Retrieved August 31, 2011. The remains of houses at Bandalier National Monument, New Mexico. Photo © 2003 Jacob Rus. Entrance to one of the Gila Cliff Dwellings, New Mexico. Sinagua Indian cliff dwellings at Palatki near Sedona, Arizona. Cliff Palace, Mesa Verde, Colorado. Cliff Palace, looking south, Mesa Verde, Colorado. The cliff dwellings at Montezuma Castle National Monument, Arizona. Betatakin Cliff Dwellings at Navajo National Monument in Arizona. Ancient cliff-dwelling on the south side of Ramah, New Mexico. The rock wall of Huapoca Canyon, Mexico, with the Cueva de las Ventanas cliff-dwelling. Typical T-shaped doorway at Cuarenta Casas, Mexico. View of Vardzia, Georgia, and the valley of the Kura River below. The Cliff Dwellers Arizona Sketches by Joseph A. Monk.